This high power green laser pointer features a top precision all-metal body. Don't be fooled, some green laser pointers have a plastic body that is metalized. Our all-metal body green laser pointer is therefore robust and durable. Our high power green laser pointer features an all-glass lens that focuses the beam to a sharper, rounder, clearer dot. Powered by a Sony diode with a lifetime of 3000-5000 hours, it projects a high power green dot up to an incredible 2 miles away. And it so powerful that the beam itself can be seen for several hundred feet in darkness. That's why astronomers use it to point out constellations and stars in the night sky, the US Army uses it for training exercises, and executives at all levels use it to enhance their prestige. It's a very important tool if you get lost while hiking. Range of over 12,000 ft.
CLASS IIIa LASERS: Class IIIa hight power green laser pointers are systems with power levels of 1 to 5 mW that normally would not produce a hazard if viewed for only momentary periods with the unaided eye. They pose severe eye hazards when viewed through optical instruments (e.g., microscopes, binoculars, or other collecting optics). Class IIIa lasers must be labeled. A warning label shall be placed on or near the laser in a conspicuous location and caution users to avoid staring into the beam or directing the beam toward the eye of individuals. 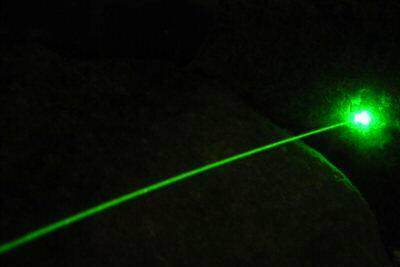 Equipment, such as some visible continuous wave Helium-Neon lasers and some solid state laser pointers, are examples of Class IIIa lasers. 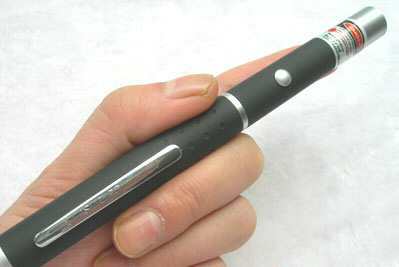 The maximum output allowable for green laser pointers by FDA is 5 mW. This is the most powerful laser pointer allowed by law. 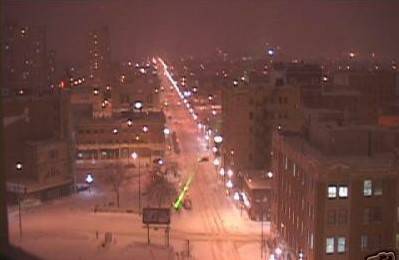 The green laser beam is clearly visible in the air. Can you really see the green laser beam? Yes, the 5mw high power green laser has a clearly visible green beam in even slightly foggy conditions, in night clubs or theatres where there is a smoky atmosphere, the beam is easy to see. What is the green laser pointer suitable for? The <5mw unit is suitable for general use as a high power laser pointer, for pointing at displays and identifying buildings and many other general uses. Are the green laser pointers suitable as children's toys? Under no circumstances should children handle these lasers, they are not toys and can be dangerous since they are extremely high power. 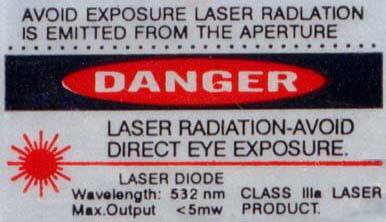 DANGER: Laser Radiation. Never look directly into the laser beam. Never point a laser beam at a person. Do not aim the laser at reflective surfaces. Do not allow children to use laser pointers unless under the supervision of an adult. What does all this technical jargon mean? The "<" symbol means "(slightly) less than" and the ">" symbol means "greater than". The "<" symbol is a legal requirement for Class IIIa laser pointers, as in some countries they are required to be lass than 5mw, so we calibrate ours to 4.99mw, hence they are within the law being less than 5mw. 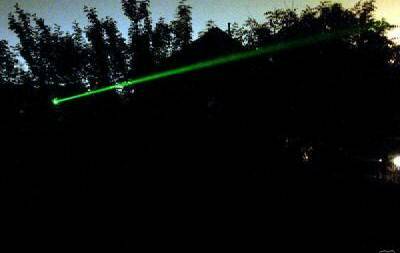 High power green laser pointers are a must have if you go hiking, look at constellations, or just to have fun with. Comes with its own sturdy, durable case for storing and also with two 'AAA' batteries. Green Laser Pointer, what can they be used for? Professional presentations, astronomers pointing out constellations and stars in the night sky, bird watching, tour guides, construction engineers and workers pointing out points of interest on a project, camping, hiking, etc. A laser is a device that projects a highly concentrated narrow beam of light which is amplified to great brightness using stimulated radiation. Lasers were invented in 1958 and since then, billions have been produced for many kinds of electronic products including all CD players. FREE SHIPPING buying 5 or more laserpointers!